Wagga Wagga Takes Two - Thursday 25th-Saturday 27th. Can’t wait to hear you sing Peter Knobel! Country Hope Christmas party another great event for the wonderful families, volunteers and supporters of Country Hope. A fun time was had by about one hundred and twenty people on a great sunny day at the Murrumbidgee Turf Club. Country Hope will be celebrating their 15th Birthday on the 11th May 2018 and we would love for you to join us for morning tea. Drop in between 10:00am and 12 midday at 25 Blake Street, Wagga Wagga; we would love to see you there. The generosity of our local businesses, volunteers and donors is second to none. The communities of Wagga Wagga, Albury, Griffith and our surrounding towns continues to exceed in generosity and it is to you that we extend our sincerest thanks in helping us help our families. ‘Wagga Skyworks’ will be Wagga Wagga’s premier New Year’s Eve celebration. Daniel Martelozzo, Dealer Principal and Director of Thomas Bros Group is the visionary for this event, which is inspired by Perth’s Australia Day ‘Skyshow’. In 2017, there will be three fantastic events taking place at three magnificent venues overlooking Lake Albert. Wagga Skyworks will encompass a free community event, which will take place at APEX Park, Lake Albert, and two ticketed events at the following licensed venues; Wagga Wagga Boat Club and Wagga Wagga Country Club. Organisers anticipate crowds of 10,000+ to take part in the inaugural event. Thomas Bros Group would like to establish Wagga Skyworks as an annual community and tourism event that generates positive social and economic outcomes for the city. To do this, the committee will need to secure support from the people of Wagga Wagga, the business community and Event Partner Wagga Wagga City Council. All proceeds from the event will be donated to local children’s charities including but not limited to Country Hope and Wagga Community Kitchen. 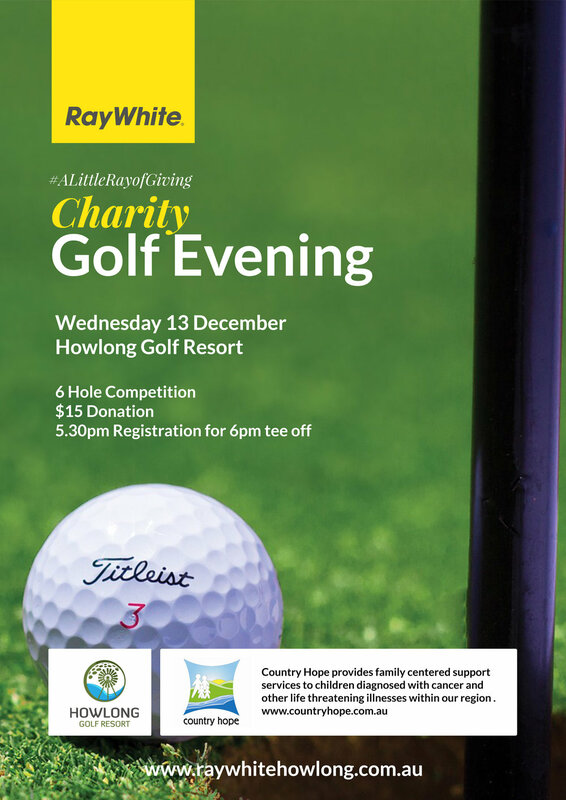 To support our #ALittleRayofGiving charity partner for 2017, Ray White Howlong along with Howlong Golf Resort are hosting a Charity Golf Evening to support Country Hope. Register your interest for the 6 hole competition on Wednesday 13 December. Each registered player will go into the draw to win a Carlton Football Club Away Jersey signed by Brownlow Medalist and Former Captain Chris Judd. To register for the Ray White Howlong #ALittleRayofGiving Charity Golf Evening, complete our Registration Form Today. Our 2017 "Time Out For Life" camp has been booked from Sunday 24th September 2017 to Friday 29th September 2017. Make sure you save the date. The camp was such a success in 2016 it will be held again at the Borambola Sport & Recreation Centre, Via Wagga - approximately twenty minutes from Wagga central. Please call us on 1800 007 880 if you would like to volunteer at the camp. We would love to hear from you. Training is provided. The "Time Out for Life" camp training weekend will be held at the Rex Airlines AAPA Campus at the Wagga Wagga Airport on Saturday 1st July and Sunday 2nd July 2017. This training weekend is for our registered carers to learn, enjoy the company of fellow carers and to feel well equipped and informed about the important role they are participating in. This year Wagga locals will be staying at home on the Saturday night and we are hoping you may be able to provide a bed for another volunteer carer. When you complete your registration form you can indicate then if you are happy to billet someone. The training weekend is a wonderful opportunity for our volunteers to strengthen existing friendships and to develop new ones. It's a great weekend and prepares our carers and support staff well for the five busy nights (not to mention the days) of camp. A dinner dance will be held at the Southside Leagues Club in Griffith on Friday 16th June 2017 starting at 6:30pm. Come along for a great night of entertainment. Kim Callaghan, who is one of Country Hope's Mums, produced her debut CD called "Kim - from the Heart", with the assistance of local singing celebrity, Roy Calabria and will be launching her CD at the Southside Leagues Club and will be joined by Peter Smith to sing their duet. Kim enjoys singing a little bit of Country and Western and favourites such as Bette Midler and Linda Ronstadt. We wish Kim all the best for her launch and hopes she enjoys her big moment. Come along and enjoy an afternoon high tea fundraiser for the Miss Wagga Wagga Quest. Country Hope is one of the recipients for this year's Quest. This camp is a fun filled week of respite and enjoyment that provides diagnosed children with an opportunity to take time out from the reality of their treatment, hospitalisation and everyday stresses associated with their medical condition. Join Country Hope for the Temora Flyers Weekend this May, a great family day out for all. At 8 years of age Heather wanted to donate her hair to make a wig for sick kids. The “Ride for Hope” is all set forSaturday 27th February 2016. Nathon Irvin is raising funds for Country Hope by taking part in Wagga Takes 2.